We started the In Other Words project to make comprehensive, engaging dictionary information easier to access than ever before. In Other Words goes beyond what is currently available in any other language reference app by offering more words, real-world usage examples, concrete definitions, word relationships, usage information, and wordplay, such as anagrams. As we embarked on this project, we realized that many commercial dictionary and thesaurus apps cling to their legacy in print, where physical page space and ways to associate words were limited. As a result, we instead opted to create a truly unabridged reference. Traditional dictionaries can provide definitions, but many fail to provide context – and language is defined by how it’s actually spoken and written. As such, In Other Words is filled with over a million real world examples from Pulitzer Prize winning and other notable books throughout the 20th and 21st centuries. The fictional and non-fictional literary examples show how authors, journalists, and scholars – not informational texts – use words. 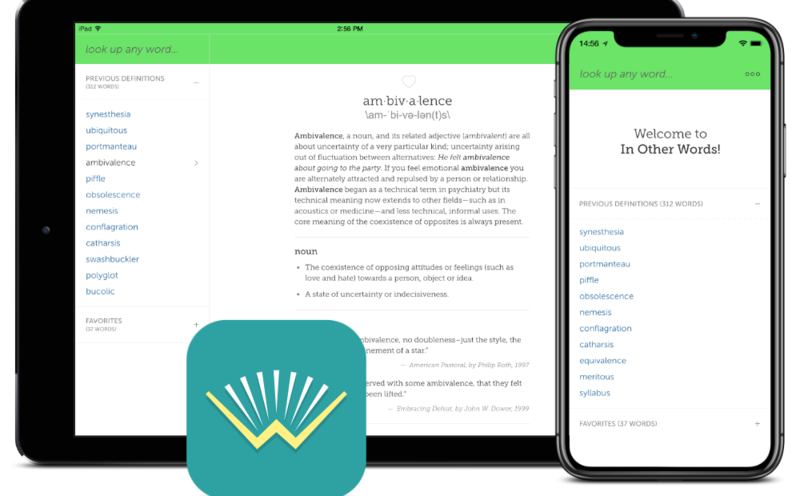 When a user looks up a word in our app, they might see it as it is used in Harry Potter, To Kill a Mockingbird, Freakonomics, the New York Times, or peer-reviewed, academic papers. Building on the excellent definitions written by the crowd-sourced editors at Wiktionary, IDEA’s lexicographic team wrote more than 2,700 short, digestible definitions for all common words, including “who,” “what,” and “the.” For over 100k other words that also have Wikipedia entries, we included a snippet of the article as well. To power the app, our team created the IDEA Linguabase, a database of word relationships built on an analysis of various published and open source dictionaries and thesauri, an artificial intelligence analysis of a large corpus of published content, and original lexicographic work. Our app offers relationships for over 300,000 terms and presents over 60 million interrelationships. These include close relationships, such as synonyms, as well as broader associations and thousands of interesting lists, such as types of balls, types of insects, words for nausea, and kinds of needlework. Additionally, the app has extensive information on word families (e.g., “jump,” “jumping”) and common usage (“beautiful woman” vs. “handsome man”), revealing words that commonly appear before or after a word in real use. In Other Words goes beyond the traditional reference text by allowing users to explore interesting facts about words and wordplay, such as common letter patterns and phonetics/rhymes. These include curiosities like anagrams, as well as words that share elements with other words, such as how “earthworm” and “earthquake” start with the same five letters or “insect” and “intersect” end with the same four. The app is presented in a clean, simple user interface that allows for quick lookups, enabling users to easily tap from word to word, learn more, save their favorites, and share their findings across multiple devices via the cloud. We also know that language is dirty. The IDEA Linguabase is based on real usage of English throughout the 20th and 21st centuries, though some references date back to the 16th century. English contains vulgarities and slurs. Moreover, words that have a neutral meaning in one era can prove offensive in another. In Other Words is delivered as a scrubbed dictionary that is family-friendly and safe for schools, with all profanity and outright offensive terms removed. The full, uncensored dictionary, including vulgarities, can be unlocked for free with an Apple ID password. Coming summer 2019. Get the beta test now! Preorder now by clicking “Buy Now” below ($4.99 USD), and receive a TestFlight download link to the app for testing. Also available now, for $25, is the beta with a custom tutorial.